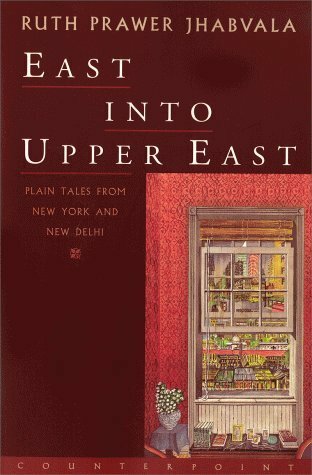 East Into Upper East is a collection of short stories by Ruth Prawer Jhabvala. Jhabvala is a Polish born in Germany and married to an Indian architect C S H Jhabvala. I have read only few stories till now from this wonderful book. Most of the stories end when you least expect them to. Most of them end, whether unhappily or not, I do not know, but there is a desire that they should have continued a little further and ended happily. The stories thus end in incompleteness. On second thoughts, that is what life is. It always remains incomplete and desires more, longing and craving infinitely to attain completeness. But it seldom happens rather never. The stories make your realise the how vulnerable a human is and it specially points to one’s own vulnerability. How much had I hoped that stories must have ended happily. But this is a feature of them all. When the stories close, each one leaves you staring at infinity. I just hope that it gives me energy enough to complete my story! It is a good book. My rating 4/5. Web of Deceit was the third thriller that I read this week. Again, the sequence of events makes you think forever that what exactly is going to happen next. Glenn Meade mesmerised me with his powerful writing and imagination. A New York Attorney, Jennifer March’s life was torn apart two years previously when here family was destroyed – her mother killed, brother disabled and father disappeared. Dark secrets in her father’s past make her wonder whether he was responsible for the death of her mother and leaving her brother, Bobby badly disabled. After Whiteout, I had my hands on Paranoia by Joseph Finder. It is a new degree of novel, which has touched the subject of espionage in the corporate world. Joseph has given me an opportunity to read the second gripping and fantastically written novel. An intriguing novel and a product of great imagination that keeps you engaged until the very end. I don’t like self-help books. But on strong recommendation from my wife and others, I gave a chance to myself and read the book. I liked the story and kept reading until I finished it. Few of my friends did not like the book but I would recommend them to read it just like a story and it would be a good read. I have nothing to say about the story as most of us know about it or it is easily available on internet.